Email marketing consistently delivers the highest ROI of any other digital marketing strategy. One recent study found that 53% of marketers believe email marketing delivers an “excellent” or “good” return on investment. Previous studies have shown that percentage to reach as high as 67%. But what makes email marketing so effective at delivering a great ROI? Part of the reason is its affordability. It’s cheap to send emails. When implemented properly, just a single, well-executed email marketing campaign can bring in a ton of revenue. And part of email’s effectiveness stems from the proliferation of email automation tools like Constant Contact and MailChimp. Marketers no longer need to rely on developers to code HTML emails. Instead, they can rely on drag-and-drop tools to build professional-looking emails and automated drip sequences in minutes. Furthermore, building an email list, integrating email into other marketing campaigns, and measuring email marketing success is now easier than ever thanks to these tools. Of course, there’s still the issue of choice. Which email marketing platform is best for YOUR business? Here’s a detailed breakdown of two of the most popular to help you make the best decision. Constant Contact is an email service provider that was founded in 2004. It’s one of the most established email marketing platforms out there. That said, there are pros and cons to Constant Contact. Here’s how its features break down. Constant Contact makes it especially easy to build emails. Its email editor offers over 100 templates to start from, and it can even crawl your website to create your own custom-branded template automatically. For this reason alone, Constant Contact is great for businesses with thin marketing resource, or any company that doesn’t have a lot of technical expertise in-house. You can create HTML emails just by dragging and dropping objects in the builder. *NOTE: Compared to MailChimp, Constant Contact’s templates aren’t quite as modern in appearance. But they can be changed easily using the drag and drop interface. Constant Contact provides users with autoresponder emails. These are emails that are sent on specific dates (like on birthdays) or based on triggers (like when someone signs up for your mailing list). With the “Email Plus” package, you can also send coupons, surveys, and other types engagements. When it comes to analytics, Constant Contact is somewhat lacking. It will report some basic info, such as who opened and clicked your emails. But it falls behind when compared to the robust reporting tools of other platforms. You can integrate it with Google Analytics to track conversions, however. One noteworthy feature is Constant Contact’s email segments tool. This lets you send targeted and rule-based emails that are governed by your email lists. Lastly, if you’re an event manager, you may want to choose Constant Content specifically for its event management software. You can track event registrations, attendees, and even take payments online. Constant Contact is free for 60 days. But after that, you need to purchase a premium version. The Email Plus package includes features like event marketing, surveys & polls, coupons, and new customer consultations. If you take email marketing seriously, you should sign up for the Email Plus package. You can also call Constant Contact to get pricing on custom template design services. Founded in 2001, MailChimp is an automation platform as well as an email marketing client. It’s now one of the most popular email marketing platforms on the market. Customers love it for its ease-of-use, affordability, it’s integrations, and it’s robust reporting. MailChimp’s email editor is comparable to Constant Contact’s. Although MailChimp doesn’t provide as many email templates, its templates are a bit sleeker and more modern-looking. Just like with Constant Contact, you can code your own emails or use the drag-and-drop tool. 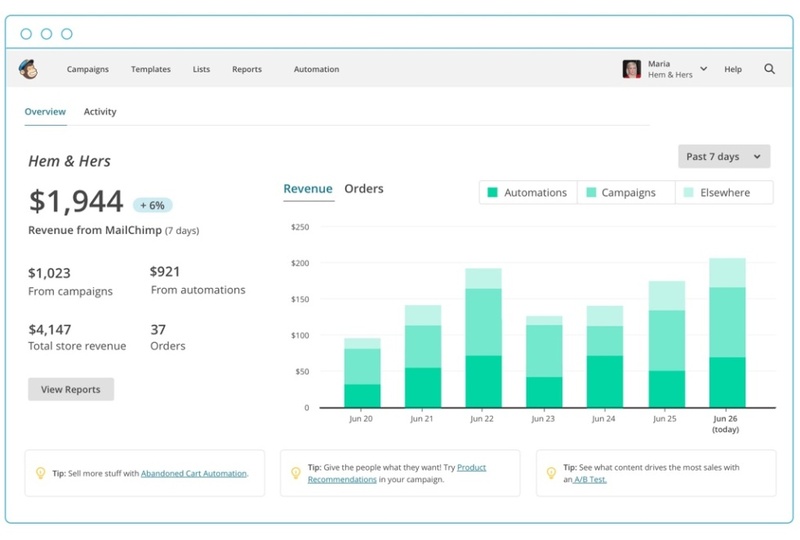 MailChimp has many of the same features as Constant Contact, but it stands out in terms of automation and reporting. Constant Contact may offer autoresponder emails, but MailChimp lets you integrate more sequences into your email marketing campaigns. Campaigns can even be triggered by recipient actions and your segmented lists. In other words, one recipient may receive a different email than another based on their segmentation—but both can be part of the same campaign. You can even do A/B testing. Unlike Constant Contact, MailChimp lets you build other elements into your campaign, including ads and landing pages. Of course, the one area MailChimp truly stands out is in its reporting features. The platform gives you a clear view into the specifics of each campaign, as well as your ROI for using the platform. Of course, if you want to use your own reporting and analytics tools, you still can. MailChimp also has over 800 integrations, far more than Constant Contact. MailChimp offers a completely free version of their platform (vs Constant Contact’s 60-day trial). It’s literally free forever. Naturally, it comes with limited features, but you can still import 2,000 subscribers, send 12,000 emails per month – AND excess basic automation. As far free access goes, this is one hell of a deal. NOTE: “Grow” is the best option for small-to-medium-sized businesses, while Pro is a better choice for enterprise companies. Like Constant Contact, you must pay more depending on your number of subscribers. MailChimp’s pricing varies depending on the plan you choose, but you can have as many subscribers as you want if you’re willing to pay. *If you only send emails occasionally, you can even pay per use. Choosing between these two email marketing platforms may be a challenge, but there are some key distinctions that should help figure out which solution matches your pain-points. If you just want to send a newsletter, a MailChimp “Grow” plan, or even their free version, may suffice. If your company hosts a lot of events, Constant Contact’s event features may be the best way to see a significant ROI.